Our patchouli and eucalyptus candles are made with soy wax and scented with pure aromatherapy essential oils. No parafin wax or synthetic fragrances ensure that our candles burn beautifully with no wasted wax left on the glass and fill your room with a warm and harmonising aroma. Love this candle. Bought at Knit and Stitch at Alexandra Palace last year and it’s still going. Fresh clean scent reminds me of smell of spas. 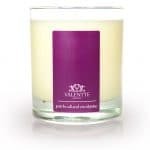 I recently purchased this candle in a gift box at the Highclere Country Show. I’ve used lots of organic candles in the past but this one is the best. I’ve always suffered with my sinuses so chose this scent. It’s very soothing and calming and not overpowering. I also bought mandarin handcream which was also fantastic. It’s intensley moisturising and has helped rejuvenate my hands. Very pleased with these products. This combination of fragrances is interesting, unique and creates an amazing smelling room. The candle is not huge but I find it lasts for ages. A really high quality product. I really love this candle. Best quality that I have bought for value burning and sent. say is nothing at all. I got a gift set with this fragrance in a candle and the lemongrass candle and hand cream. These products are excellent. The candles last a really long time and one candle burning fills a couple of rooms. I bought the soy wax candles in Patchouli and Eucalyptus, and Geranium and Ylang Ylang, as well as the White Neroli and Lemon hand cream. They all smell beautiful, and the hand cream is lovely and moisturising without being greasy. Customer service was excellent and thrilled with purchases! 10/10 would recommend. Absolutely stunning fragrance. Wafted around the room and further. Can even smell when not lit. Looking forward to purchasing again. I received a patchouli and eucalyptus soy wax candle as a free gift alongside a recent order, and all I can say is, “Wow!”. I would never have thought of ordering this combination, but I’m truly converted. The scent is divine – calming and cleansing – just perfect for my lounge. I wouldn’t hesitate to recommend this candle to anyone looking for the perfect relaxing blend in their home. Amazing candles, I’ve bought these at Badminton and Burghley horse trials for the last two years and all I can say is they are the best candles I’ve ever purchased! They smell fantastic and burn for hours, the aroma is beautiful and very uplifting. I can also highly recommend the body scrubs 100%. Would love them to bring out a shower gel in the future. Another gorgeous candle. Great aroma. Guests always comment on how lovely my home smells. I don’t buy any other candles now. This is one of my favourite scents along with the lemongrass and neroli. These candles are by far the best and I wouldn’t buy anywhere else! 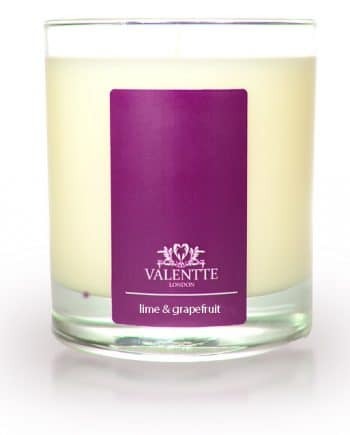 I first discovered Valentte at the Kirstie Allsop’s Handmade Fair at Hampton Court. This is my first Valentine candle we have tried. We have candles everywhere but this fragrance is exceptional. The candle is ideal, as suggested , for a smaller front room but would certainly be ideal in a larger one too. The fragrance is lovely and drifts through the house. Highly recommended and the best candle we’ve ever bought! Need I say more???? I am a very happy customer . As I received this candle free with my recent purchase. Another amazing candle. The patchouli and eucalyptus candle is really the best its fragrance is lasting and burns to the bottom ,even when its not burning you can smell the fragrance, i mostly buy in a gift box with the reed diffuser and the room fragrance for myself ,it also makes a fantastic gift which always gets great response in my experience .I have bought other fragrances from valentte as gifts with the same great response . great products !!!! 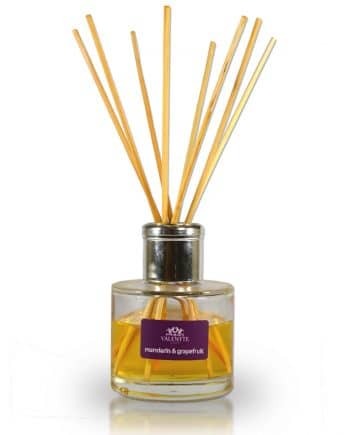 Another fabulous product, having also used the room sprays and diffusers. Scent is natural & strong without being overpowering and lasts the whole time until the candle burns down. Long burn time means the candle lasts a long time. Highly recommended. Best candle ever, it burns evenly and you only need it alight for about 15 mins before the whole room is smelling lovely, so it last a long time. Really good for getting rid of cooking smells too. I have yet to light this candle but it smells divine.I could smell this before I opened the box and it is now sitting on my worktop awaiting it’s turn and It smells gorgeous each time I walk past.